Picklex 20 is a one step metal prep and so much more. It prepares your surface for paint but also removes rust, converts rust and even prevents rust prior to painting. 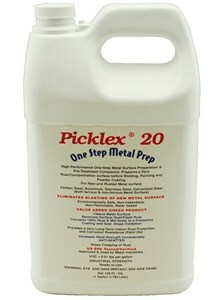 Picklex 20 is a highly effective metal prep for just about any new or old steel surface. It prepares the metal surface for priming, painting or powder coating without the need for sanding or abrasive blasting of the surface. On new metal surfaces Picklex 20 will clean mill oil, dust and light surface rust while conditioning and creating a conductive conversion coating. This one-step process reduces cost and time needed for metal preparation. On heavier rust and mill scale Picklex 20 chemically changes rust/scale into a conversion coating. In the case of flash rust or white rust, the rust is completely removed. On any rusted surface, the coating stops the oxidation process. Because only a thin coat is required, the gallon container covers 1600 square feet, making the cost per square foot very economical. Whether you're working in a commercial setting or just working on a small project, safer products are better for everyone. Picklex 20 isn't just safer to use but is highly effective. The product is water based, non-toxic, non-hazardous, non-flammable and water-soluble. Because it is safer, it can even be shipped by air if needed. Picklex 20 provides excellent indoor protection from corrosion. The indoor protection provided eliminates flash rust while leaving the metal surface ready for painting if outdoor protection is needed. Picklex 20 can be applied by spraying, brushing, wiping or dipping. The wide range of application methods make it possible to use on a variety of different surfaces and items. Applying Picklex 20 will provide a conversion coating for better paint bonding. It will remove mill oil (heavy oil and grease needs to be removed prior), clean the surface of dust, remove surface rust, and convert weld/laser scale. After applying Picklex 20, wipe the surface dry and then let air dry. After drying, the surface can be left indoors for years without rusting. After drying the surface is ready for priming (do not use self etching primer), liquid painting, electrostatic painting or powder coating. Any kind of paint or primer (except self etching primer) is compatible with Picklex 20. Spray, brush or dip new metal surface with Picklex 20 for very long term (several years) indoor protection. This indoor rust protection can be in a warehouse, in transit or even in covered outdoor locations. After storage or shipping, Picklex 20 does not need to be removed prior to welding or painting. Picklex 20 prepares the metal surface by cleaning mill oil and dust, removing rust and providing a conversion coating. Welding can be performed after the product has dried. Picklex 20 enhances weld strength and does not form weld splatter. Removal of mill scale is not needed when using Picklex 20 prior to welding. After welding is completed, spraying Picklex 20 on the hot weld will reduce heat scaling and provide a protective coating for future bonding. Picklex 20 does not cause hydrogen embrittlement. In addition to use on ferrous metals such as steel and iron, Pickelex 20 can be used on other metal surfaces like aluminum, galvanized steel and stainless steel. Q. Should Picklex 20 be removed prior to painting? A. No, it provides a very good surface that is ready for paint. It does not require removal prior to painting or welding.